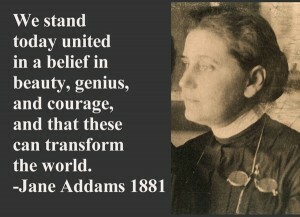 The origins of social work in America are thought to be with Hull-House, a settlement house founded by Jane Addams in Chicago in 1889. Settlement houses shared a purpose with social work as a whole: to provide a place where needy people could go and access services such as food, housing, social support, and education. Since the beginning, social work has been primarily focused on helping children, young people, and families in poor and impoverished areas empower themselves through education and direct democratic action. 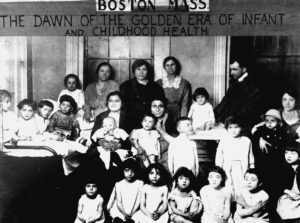 Boston’s first settlement house was opened three years later in 1891. Located in what is currently the Shawmut neighborhood in the South End, Andover House was a place of children’s clubs and adolescent literary societies. Later renamed South End House, it was always a safe place for needy children in the neighborhood, including finding new homes and families for orphaned children. Taking care of children is an integral part of the social work movement in Boston. Children were believed to need more fresh air and time to play, which was a rare commodity before and during the Industrial Revolution. Much of the work done with children was toward getting children out of the city and into fresh air, or outside on to playgrounds, the first of which was opened by the Children’s Mission in the North End. It’s no wonder, then, that the site for the Home for Italian Children was on an open and airy 10 acres of farmland in Jamaica Plain. 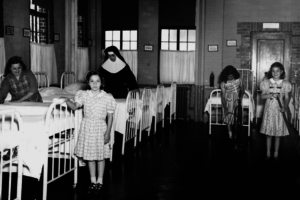 For the first fifty years, the Home for Italian Children was solely an orphanage and group home whose children were cared for by nuns of the Franciscan order. It was here that children who had lost their families to the 1918 influenza epidemic were able to find respite and fun under the caring guidance of the nuns. While away from the hustle and bustle of downtown Boston, the children of the Home were never far from the community. The children were visited by celebrities such as singer Bobby Breen, Santa, and the Easter Bunny, given benefit concerts with headliners Tom Jones and Sammy Davis, Jr., and participated in activities as musical theater productions and fishing trips. Today, the children at Italian Home are treated to the annual Sunsplash carnival and visits from local celebrities like Zdeno Chara of the Boston Bruins. Santa and the Easter Bunny continue their long standing tradition of bringing joy and gifts to children of all faiths, as well. Eventually, children with behavioral issues and abuse and neglect victims of all races and nationalities were admitted. 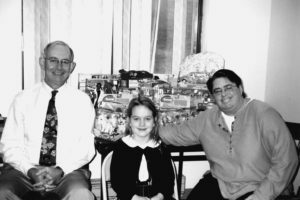 These changes brought even more: the Home for Italian Children became Italian Home for Children, and social workers were brought on staff to care for the children alongside the Sisters of the Franciscan Missionary Order. By the end of the 1970’s Italian Home would officially separate from the Catholic Church. While the faces of the caregivers and children have changed, Italian Home continues the nuns' legacy by having a goal-oriented therapeutic approach to helping children via a multitude of services including residential dorms that are made to feel like a safe and welcoming home. In the 100 years of Italian Home, the health and happiness of the children we serve has been at the core of everything we do. Join us in serving these children and families for 100 more! Thanks To Julie Hanneman, Italian Home's Macro Social Work Intern, for writing this piece.